This species is found in a single locale in BC. 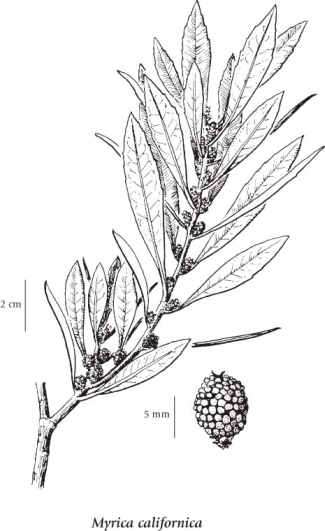 Shrub or small tree, 2-6 m tall; stems spreading, hairy and finely wax-dotted when young, glabrous at maturity. 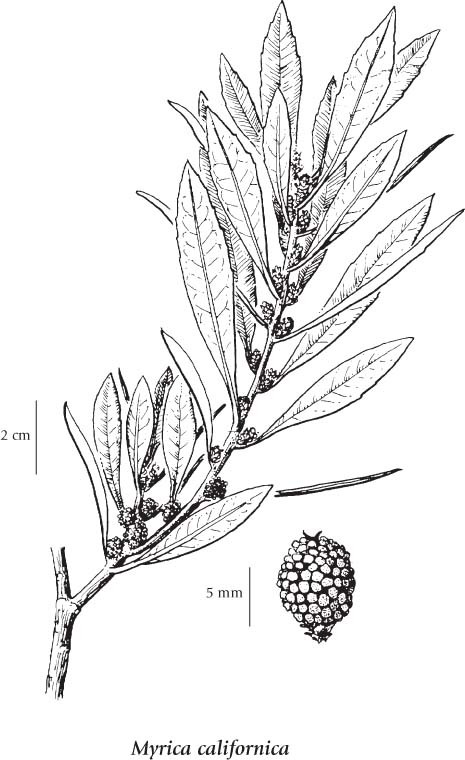 Alternate, evergreen, oblanceolate, 5-8 cm long, entire to coarsely toothed, glabrous above, finely black-dotted and hairy below, usually sharp-pointed, aromatic. Inflorescence of male and female flowers in spikes on the same plant; male spikes 5 mm long, the male flowers with 3-12 stamens, the filaments more or less fused, often bracteate, exceeding the subtending bract; female spikes 1-2 cm long, the main bract larger than the 2 subtending bracteoles. Nutlets, winged, 4-8 mm long, round, strongly warty and waxy. Mesic to moist shoreline thickets, beaches, clearings and roadsides in the lowland zone; rare in SW BC, known only from the Tofino-Ucluelet area; S to CA.